Undoubtedly, my favorite kitchen designer is Christopher Peacock. With a quick browse through your kitchen tear sheets, I bet your sure to find at least one (or a ton in my case) Christopher Peacock kitchens. I was already excited about the ceiling design feature in the Oct. 2010 issue of Traditional Home, but I was ecstatic to find a peek inside the home of Christopher Peacock. 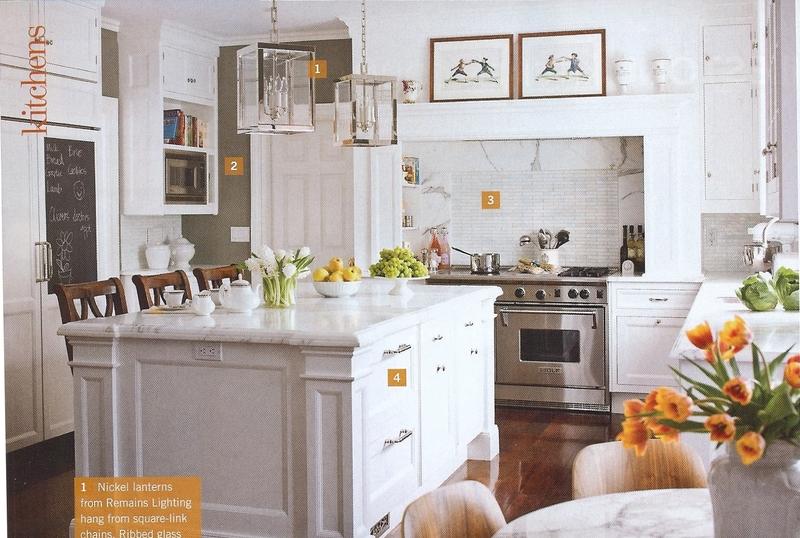 Christopher Peacock has become known for clean and classic white kitchens (which is probably why I love him so much) so I wasn’t surprised to see that he went with white for his own kitchen. I love the pop of orange in the Roman shade over the sink, although I do wish it was mounted just beneath the crown rather than inside mount so more of the fun paisley print could be seen. A warm grey called “Abbey Walls” from his own paint collection was chosen to warm up what could have become a cold space. A classic mantel style hood accented with a glass mosaic backsplash creates a great focal point for the room. I always the love the newel detail found on the island in many Peacock kitchens and I am dying to steal (or borrow) the idea for the chalkboard panel on the refrigerator. 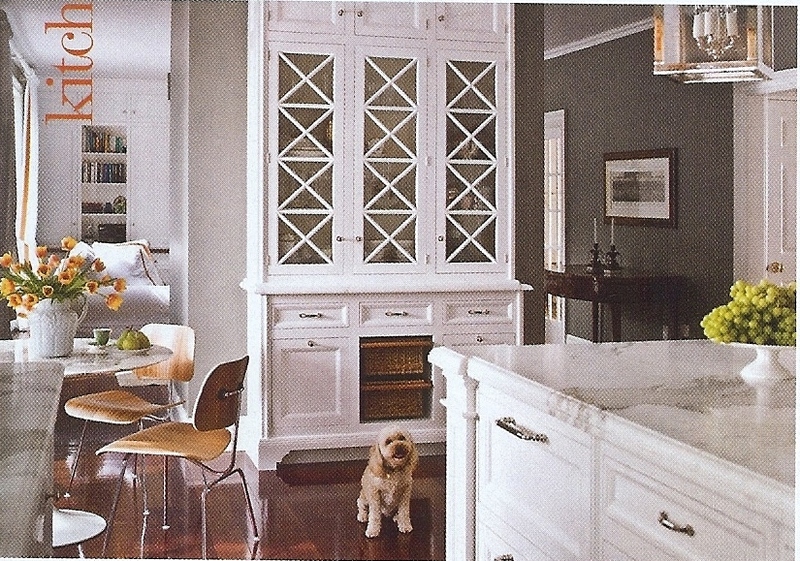 A fabulous hutch with criss cross mullions acts as a divider between the kitchen and family room. Peacock turned to New York based interior designer Sophie Thibon for help with the design of the family room. 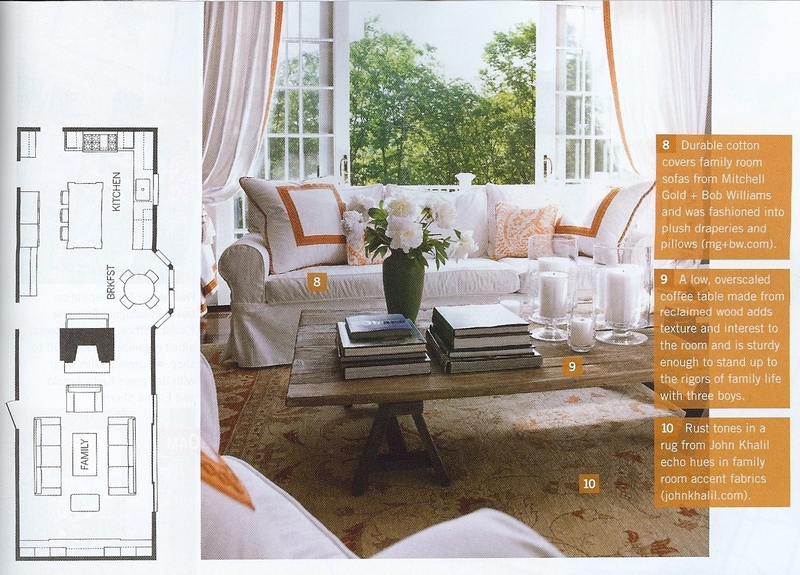 The color palette of white accent with orange and warm grey walls is carried throughout the space. I find it interesting that he said “As a kitchen designer doing your own kitchen, you feel this inherent pressure to wow people, but I didn’t want to do that. I didn’t want to be a walking advertisement of myself” but this kitchen to me a classic Peacock kitchen and represents his company completely. What are your thoughts? This entry was posted in Details, Interior Design, Kitchen Design. Bookmark the permalink.